SHANGHAI, China, 2018-Oct-16 — /Travel PR News/ — Hilton (NYSE: HLT) and Hilton Hotels & Resorts today (October 12, 2018) announced the opening of Hilton Taipei Sinban. The opening marks Hilton’s return to the Taiwan market after 15 years, making it New Taipei City’s first international upscale hotel. The 31-story, 400-room hotel offers itself as an optimal choice for business travel and gatherings with extensive meeting facilities and convenient connections to traffic hubs. 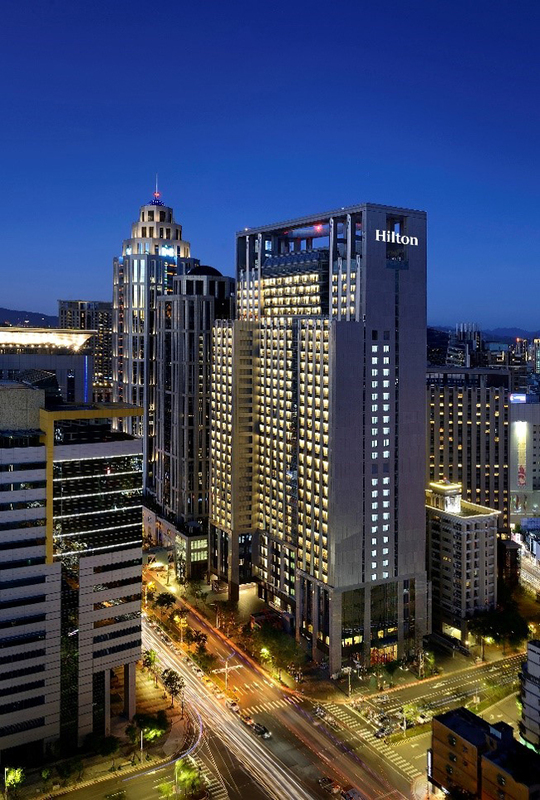 Hilton Taipei Sinban is owned by Hong Guo Group Co., Ltd. and managed by Hilton. Guests can enjoy a selection of cuisines at the hotel’s Chinese restaurant, an all-day dining venue, and the lobby bar. QING YA specializes in a mix of Taiwanese and Cantonese delicacies, serving the chef’s signature entrées of regional favorites. Market Flavor features an abundance of international flavors for all-day dining, with local seafood and meat dishes designed to be both visually and palatably delightful. The lobby lounge, SociAbility, serves deli snacks, sweet treats and beverages in the day and transforms into a bar with select wines, beers, rare malts and handcrafted cocktails at night, setting the perfect atmosphere for winding down or catching up with friends. Hilton Taipei Sinban offers guests an ideal place to rejuvenate with 400 contemporary and stylish guest rooms, including 38 deluxe suites and 14 premium suites. Guests can enjoy modern amenities, such as a 50-inch HDTV, espresso machine and high-speed Wi-Fi, all complemented by beautiful city views. Guests seeking exercise or relaxation can reenergize at the 24-hour fitness center, dip in the rooftop infinity swimming pool while enjoying spectacular sunset views, or unwind with complimentary refreshments at the exclusive Executive Lounge with a private terrace. Hilton Taipei Sinban is also part of Hilton Honors, the award-winning guest-loyalty program for Hilton’s 14 distinct hotel brands. Members who book directly through preferred Hilton channels have access to instant benefits, including a flexible payment slider that allows members to choose nearly any combination of Points and money to book a stay, an exclusive member discount, free standard Wi-Fi and the Hilton Honors mobile app. bookings through October 12, 2018, when booking directly with Hilton. Hilton Taipei Sinban is located at No.88, Minquan Rd., Banqiao District, New Taipei City, 22050, just 28 kilometers from Taiwan Taoyuan International Airport, and 14 kilometers from Taipei Songshan Airport. For more information, or to make a reservation, travelers may visit taipeisinban.hilton.com or call +886 2 2958 3000. For nearly 100 years, Hilton Hotels & Resorts has set the benchmark for hospitality around the world, providing new product innovations and services to meet guests’ evolving needs. With more than 575 hotels across six continents, Hilton Hotels & Resorts properties are located in the world’s most sought-after destinations for guests who know that where they stay matters. Hilton Honors members who book directly through preferred Hilton channels have access to instant benefits. Begin your journey at www.hilton.com and learn more by visiting newsroom.hilton.com/hhr or following us on Facebook, Twitter and Instagram. Hilton (NYSE: HLT) is a leading global hospitality company, with a portfolio of 14 world-class brands comprising more than 5,400 properties with nearly 880,000 rooms, in 106 countries and territories. Hilton is dedicated to fulfilling its mission to be the world’s most hospitable company by delivering exceptional experiences – every hotel, every guest, every time. The company’s portfolio includes Hilton Hotels & Resorts, Waldorf Astoria Hotels & Resorts, Conrad Hotels & Resorts, Canopy by Hilton, Curio Collection by Hilton, DoubleTree by Hilton, Tapestry Collection by Hilton, Embassy Suites by Hilton, Hilton Garden Inn, Hampton by Hilton, Tru by Hilton, Homewood Suites by Hilton, Home2 Suites by Hilton and Hilton Grand Vacations. The company also manages an award-winning customer loyalty program, Hilton Honors. Hilton Honors members who book directly through preferred Hilton channels have access to instant benefits, including a flexible payment slider that allows members to choose exactly how many Points to combine with money, an exclusive member discount that can’t be found anywhere else, and free standard Wi-Fi. Visit newsroom.hilton.com for more information, and connect with Hilton on Facebook, Twitter, LinkedIn, Instagram, and YouTube. This entry was posted in Hotels, Luxury, Resorts, Travel, Travel Services, Travelers and tagged Hilton, hotel, Qian Jin, Sinban, Taipei. Bookmark the permalink.